An 8" square congratulations cake, comprising golden sponge, vanilla buttercream, raspberry jam filling, covered in an ivory sugar paste. 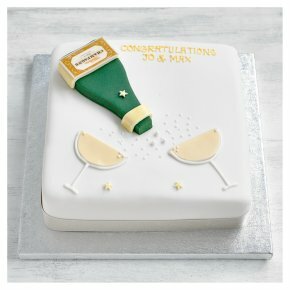 Cake is decorated with a sugar paste champagne bottle & two sugar paste glasses. INGREDIENTS: sugar, water, fortified wheat flour (wheat flour, calcium carbonate, iron, niacin, thiamin), rapeseed oil, raspberry jam (maize and wheat glucose syrup, raspberry purée, water, gelling agent (pectin), colour (anthocyanins), acidity regulator (citric acid), preservative (potassium sorbate)), butter (milk), maize and wheat glucose syrup, dried free range egg, humectant (vegetable glycerine), emulsifiers (mono- and diglycerides of fatty acids, sodium stearoyl-2-lactylate, polyglycerol esters of fatty acids, lactic acid esters of mono- and diglycerides of fatty acids, soya lecithin), palm oil, wheat and maize glucose-fructose syrup, stabilisers (tragacanth, xanthan gum, cellulose), apricots, raising agents (diphosphates, sodium carbonates), salt, milk whey powder, preservative (potassium sorbate), flavouring, dried free range egg albumen, colours (plain caramel, curcumin, copper complexes of chlorophyllins, beetroot red, vegetable carbon, riboflavin, titanium dioxide, iron oxide), gelling agent (pectin), thickener (maize starch), acidity regulators (citric acid, sodium citrates), coconut oil, glazing agents (white and yellow beeswax, shellac).